Work with the Cosmos, putting the celestial winds at your back. While we'll look at the potentials in your natal chart, the focus of consultations is on what's going on now, particularly in the next 6 - 12 months. Click here to order a consultation. While we can often accomplish a great deal in a single session, astrological coaching offers us the chance to explore one or two matters in depth over the course of 3 or more sessions. Click here for more on Astrological Coaching. This is an extended, in-depth consultation that focuses on multiple areas of life including the usual career, relationship, finances, and health. We'll go into those areas in detail, and also examine creativity, spirituality, spirituality and religion, learning styles, gender and sexual roles, and friendships. Beyond that, we'll emphasize the integration of those areas. Click here to learn more. 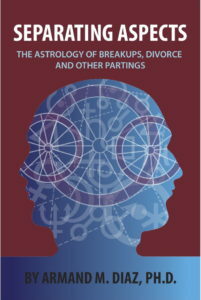 More than an astrological take on separations and divorce, Separating Aspects is a comprehensive guide to relationship astrology. Different relationship patterns are described, as well as how to apply these to each partner and the relationship as a whole. Changes and transitions in partnership are analyzed in terms of the four outer planets: Saturn, Uranus, Neptune, and Pluto. Opportunities for growth as well as challenges are outlined in practical terms. Available on Amazon (Kindle version is also available!) and most online retailers throughout the world. 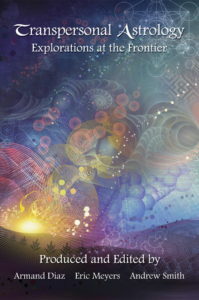 A collection of seventeen essays on transpersonal astrology, this book is filled with ideas that will stimulate not only astrologers but anyone interested in consciousness and this time in our planet's evolution.